The flute&guitar duo couldn’t be missed in our collection of duos with guitar. Here we present a very special and unusual programme. Music by Von Call. Including three arrangements from the Opera theatre of the time. 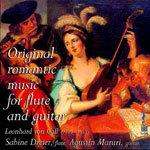 Virtuoso style music fantastically played by the German flutist Sabine Dreier. We also include a beautiful encore piece by French composer Jacques Rode. A Polonaise that shows the great quality of Rode’s music. All the works are first world recordings.